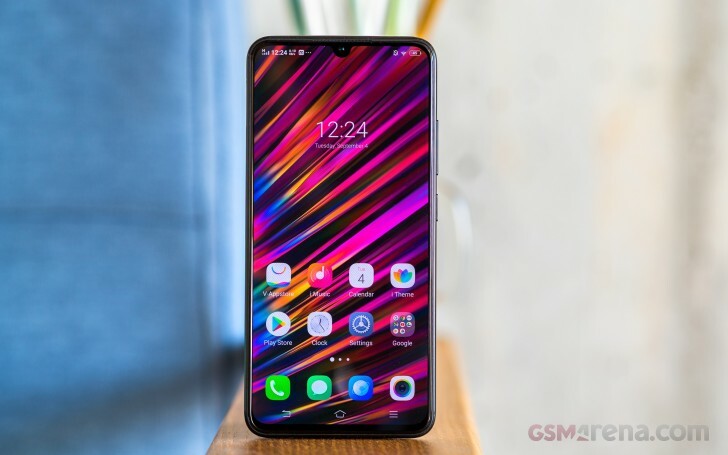 The vivo V11 packs a 6.41" Super AMOLED screen of 1080p resolution with one of the smallest cutouts we've seen ever as it was meant for a camera and nothing else. The panel has a very decent pixel density at 402ppi. The actual resolution is 1,080 x 2,340 - that's 19.5:9 aspect - one of the tallest around. While that's not the highest number of pixels we've enjoyed, the display looks great and its punchiness makes every picture spring to life. vivo hasn't specified the glass it used to protect the screen. There's no way for us to know if it's Corning-made or comes from another manufacturer and how scratch resistant it is. In any case, vivo is selling the V11 with a factory-applied screen protector in most markets, so it's probably better to use it that way if you are willing to live on with some extra reflections. vivo doesn't offer many display options - only a manual color temperature slider in Settings that you can move towards cooler or warmer. The coldest possible one is chosen by default. The screen supports the DCI-P3 color space and is decently accurate with an average deltaE of 5 and maximum deviation of 11 at point white. If you set the color temperature to the halfway point between Cool and Warm, you'll get one very accurate color presentation with an average deltaE of 3. The screen has a very decent brightness for an OLED panel of 418 nits. But unlike the AMOLEDs on various Galaxy smartphones, the one on the V11 has no outdoor boost and 418 nits is the best it can do. Sunlight legibility is in line with other OLEDs and our sunlight score means excellent contrast and visibility. Some Galaxy devices do score higher, but at this point the differences are marginal. The vivo V11 is powered by a large 3,400 mAh battery. It offers vivo's custom solution called Dual-Engine Fast Charging. As it turned out this is just another word for the 18W QuickCharge 3.0 as it works with any QC3-compatible charger so no need to worry about proprietary chargers. The phone does come bundled with an 18W charger, which is much appreciated too. The 9V/2A adapter can bring the V11 from 0% to about 45% in around 30 minutes, which is rapid enough. Better yet, you won't need to do it too often as the the vivo V11 scored an excellent result in our battery test with a 98-hour Endurance rating. It did a great job in all tested scenarios - video playback, calls, web browsing and demonstrated outstanding stand-by performance. If you decide to enable the offscreen unlock option, which keeps the UD fingerprint scanner active and displays a small fingerprint icon on the screen to mark that sensor, well, the V11 standby endurance gets halved and the final score suffers. Our endurance rating denotes how long a single battery charge will last you if you use the vivo V11 for an hour each of telephony, web browsing, and video playback daily. We've established this usage pattern, so our battery results are comparable across devices in the most common day-to-day tasks. The battery testing procedure is described in detail in case you're interested in the nitty-gritties. You can also check out our complete battery test table, where you can see how all of the smartphones we've tested will compare under your own typical use. The vivo V11 has a single bottom-firing speaker. It scored a Very Good mark in our loudness test. The sound output is rich with deep bass and we had no complaints even when playing music at maximum volume. The vivo V11 had faultless output with an active external amplifier - great clarity and nicely high loudness. Headphones caused a hike in stereo crosstalk that was about average and introduced some intermodulation distortion, but the overall output is still of decent accuracy. Volume dropped a bit, but remained well above average, which is another win for a handset in this price range.